Roxburgh wrote: Dugald et al. One good thing coming out of this thread. I intend to take a full and comprehensive oral history of her wartime experience from my mother while she is still with us. I think this is a great idea. Many times i wished i had done that with my father. i had intended to do it so many times, yet before i knew it , I was too late. Your mother's oral history will be a worthwhile venture... good luck with it Roxburgh! Not sure if you guys have seen this site, I heard an appeal on R4 for them and looked them up. They have some good stuff including a lot of personal experiences and photographs, quite a few Glasgow related ones. Roxburgh wrote: Firstly, there was no real experience of mass bombing of civilian targets and it is hard to make contingency plans for the unknown. In June 1917, 17 German planes had dropped about two tons of bombs on central London, killing 172 people in the area of Liverpool St. Station. This was the worst single incident although in the whole of 1917-18 1,413 civilians were killed by enemy aerial action, which was then still very much in it's infancy as a science. Lesson enough there I would have thought. Despite the amazing resilience of the population there was a distressing tardiness on the part of some employers to contribute to the efforts of their workers. Initially, workers at John Brown's, for example, could not obtain hot meals at work. the rumblings of this reached as far as the Cabinet in London who learned that John Brown & Co. were reluctant to provide canteens unless the Treasuary agreed to the charging of the cost as a revenue expense! In April 1941 Winston Churchill was obliged to write to the company on the subject and meals were provided promptly thereafter. Firstly, there was no real experience of mass bombing of civilian targets and it is hard to make contingency plans for the unknown. HH, I think Roxburgh is quite correct in his statement here. The bombing during 1917-18 which we're told took 1413 lives, did not stem from what was known as "mass bombing". Many of the casualties from aerial bombing in the Great War were from a single airship and/or single or a few planes, hardly "mass bombing.". I'd guess the raids referred to by Roxburgh, were by great air armadas. A perfect example of "mass bombing" is the RAF's bombing of Hamburg by about 800 heavy bombers in July 1943. It was the fear of bombings of this magnitude and how to cope with them that made contingency plans so difficult. Armaments and aircraft had changed a great deal since the 17 planes dropped two tons of bombs on London... some of the Hamburg bombs weighed more than 2000 lb each .. I don't think the WW I bombing experience would constitute "Lesson enough". "there was a distressing tardiness on the part of some employers to contribute to the efforts of their workers." We might note first of all that this applied to only "some employers". At this time, 1941, it was still very much an era of the "piece in the pocket 'n tea can" lunch-time dining, so perhaps Browns' lacked the facilities to provide hot meals, I don't know. When the meals were promptly provided thereafter, I wonder who picked up the tab, Browns or the Treasury. It's rather awkward being in a position that looks like I'm defending Browns, when in fact it is the "the universal spirit after the bombings" I am defending. Anyway HH, it's an enjoyable novelty receiving a contribution from you on this topic. HH, I think Roxburgh is quite correct in his statement here. The bombing during 1917-18 which we're told took 1413 lives, did not stem from what was known as "mass bombing". Many of the casualties from aerial bombing in the Great War were from a single airship and/or single or a few planes, hardly "mass bombing.". I'd guess the raids referred to by Roxburgh, were by great air armadas. A perfect example of "mass bombing" is the RAF's bombing of Hamburg by about 800 heavy bombers in July 1943. It was the fear of bombings of this magnitude and how to cope with them that made contingency plans so difficult. Armaments and aircraft had changed a great deal since the 17 planes dropped two tons of bombs on London... some of the Hamburg bombs weighed more than 2000 lb each .. Yes, Dugald, but it's worth noting that the Clydebank raids took place in 1941, that being the case, it's hard to see how Glasgow could have learned any lessons from the bombing of Hamburg in 1943. Dugald wrote: I don't think the WW I bombing experience would constitute "Lesson enough". Ten ton of bombs dropping on the centre of any city would be 'Lesson enough' for most folk I would have thought. My 'apparent questioning' is neither here nor there, the facts speak for themselves. I suspect that John Brown's, one of the greatest shipbuilders the world has ever known would have found no great difficulty in establishing a canteen & providing hot food for the workers who were travelling great distances to get there. Further to this, I imagine that the procurement of hot food at any time of the day would have been rather difficult for many members of the 'local' workforce too. It seems to me that logistics was not the core problem in John Brown's failure to provide basic facilities, I believe that it had more to do with the 'attitude' of the employer. Dugald wrote: Anyway HH, it's an enjoyable novelty receiving a contribution from you on this topic. Aye, Dugald, I'm well known for giving good value in the novelty stakes. "Yes, Dugald, but it's worth noting that the Clydebank raids took place in 1941, that being the case, it's hard to see how Glasgow could have learned any lessons from the bombing of Hamburg in 1943." What you say here HH, is of course quite correct...in 1941 we weren't going to learn any lessons from Hamburg. I did a poor job of explaining what i meant with the mention of Hamburg . It was meant only as an indication of the "great armada" style of bombing to which I think Roxburgh was referring. This was the type of bombing H.G.Wells led many people to expect , and it was generally expected immediately after the war started. Sorry, I'll have to finish later, breakfast beckons! Lets look at what actually happened between 1939 and 1941. The main attack was expected to hit London and the British Air Staff calculated that the Luftwaffe could deliver 700 tons of bombs a day on London, each ton causing at least fifty casualties. As a result, British children were immediately and efficiently evacuated from the cities and into the countryside. The reality was quite different. Early RAF daylight bombing raids in WW2 were destroyed by German fighter planes and night raids often failed to get anywhere near their targets. The Germans did not mount any large scale raids on the UK until late 1940 and the RAF intercepted amny of the smaller ones. The authorities had prepared for a doomsday scenario based on an theory which relied on small scale colonial experience (Iraq, Abyssinia, Guernica) to give it credence. As we know now, the reality of mass bombing either in the UK or in Germany was quite different. Despite the death and destruction, people did not panic and they did not flee the cities. Mass bombing did not decide the outcome of the war (neither has it decided the outcomes of subsequent wars). Preparations for bombing were based on theory not on the reality of a WW1 experience. When reality challenged the theory, the result was complacency. On the 07th April 1941, during a fairly intense multiple target Air Raid over Glasgow, the LMS Clydesdale branch near West Street Station opposite the Junction of Kenmure Street and St Andrews Road was hit. Many houses around this junction were badly damaged with over 100 people made homeless following a stick of Bombs falling around the Junction. "Around 120 people rendered homeless arrived at the rest centre at Pollokshields Primary School only to find their way barred by the janitor who resolutely refused to let them in without instructions from the Welfare Department. The same aircraft dropped another Bomb which destroyed much of the two - storey-brick built cooperage of Slater, Rogers and Co in Seaward Street. This Bomb also started a chimney fire in a tenement at 249 Seaward Street". Excellent post there, Roxburgh, as usual. Socceroo wrote: only to find their way barred by the janitor who resolutely refused to let them in without instructions from the Welfare Department. Love it! He's now working in an NCP carpark near you. I guess when we look at the failures of that time and place, we should remember the social constraints that were pervalent then. The 'Jannie' & the MD of John Brown's were both bound by said constraints & in the end, can we really blame either? "My 'apparent questioning' is neither here nor there, the facts speak for themselves. I suspect that John Brown's, one of the greatest shipbuilders the world has ever known would have found no great difficulty in establishing a canteen & providing hot food for the workers who were travelling great distances to get there. Further to this, I imagine that the procurement of hot food at any time of the day would have been rather difficult for many members of the 'local' workforce too. It seems to me that logistics was not the core problem in John Brown's failure to provide basic facilities, I believe that it had more to do with the 'attitude' of the employer"
Here I am again HH, long after my breakfast. I don't want to get embroiled in a defence of John Browns'. And, I can't argue against the fact that John Browns' could have provided a canteen & could have provided hot food for the workers who were travelling great distances to get to the yard. I don't know why this sort of situation should have arisen, it certainly doesn't lead us to the good feeling, nor match the pride, we all felt with the launching of the Queen Mary a few short years before. I tell you though, I don't look upon it, that is the lack of warm meals, as an example of a lack of Clydeside organisation nor of a Clydeside spirit. This "private" aspect of post-air-raid organistaion, does not reflect the "[i]They'll be Bluebirds over [/i]..." spirit that was a part of my experiance in Govan. So what's this sentimantal "They'll be Bluebirds over ..." stuff? It defies definition. How about going into Jack's Bakery in Govan at the height of the Clydeside Blitz, and being told "Stick that in yur poacket sonny, it' ll still be hoat when ye get hame!... 'n watch oot fur these bloody bombs"... that's what i remember. Fascinating thread - have just read through it, and wanted to add a few wee mentions in case they are of interest. 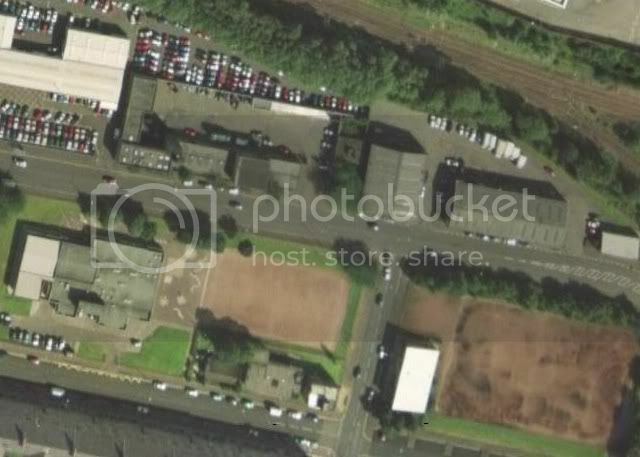 Somewhere back in the thread, there were pictures of a Cardross farm - there's a white house situated in that same location (may be a farm) which I was always told has got a flat roof due to being hit by an incendiary device during the war. As a child, I played in a WW2 concrete building in Rosneath - I've no idea what it was used for but it was built into the side of a very steep embankment leading down to a burn. Bomb craters - there are two large craters / heaps of rock in fields on the LHS of the A811 in between Balloch and Gartocharn - again, I'm told these were where bombs fell. Your excellent post here Roxburgh, clarifies clearly what I was trying to say to HH. The "great armada" style of bombing never really did hit the Clydeside just as hard as we perhaps, had expected. Oh yes, Clydebank did, sadly, get hit hard, but even this was hardly a patch on what the likes of Hamburg and Dresden suffered, in what I'd describe as "great armada style of bombing". Even the Germans, despite their great aptitude for organisation, were caught wanting in their protection of their civilian population. They had never expected a force of around 800 bombers to drop such enormous bomb loads over a periods measured in minutes... heavens, neither did those who were dropping the bombs! Your statement, "Mass bombing did not decide the outcome of the war", is of course very significant with regard to this discussion. Mind you, I hastily add that at the time we were not aware of this There was, early in the war, as mentioned by you, this fear that. "great armada" style of bombing, could decide the outcome of the war, and much that took place, took place with that in mind. The bombing of Germany, as carried out by the RAF and the USAF, was done under the premise that such mass bombing could win the war. However, as you say, " Mass bombing did not decide the outcome of the war". We may have learned a bit of a lesson from that, although recent events in Irak and Bagdahd have left us once again questioning the wisdom of it. Interesting Socceroo. I don't recall this raid at all; I wouldn't wonder, all my memory works have been used up remembering the Clydeside Blitz. I knew the area around the West Street Station quite well, often having had the occasion to go to the public weigh scale beside the subway station. Anyway, Jeffrey's story about the 120 homeless people being barred by a solitary janitor makes me wonder. Hmmmm, I can't imagine the 120 bombed-out Glaswegians paying any attention to the janitor. How would you have liked the job of telling a 120 bombed-out Glaswegians that they weren't getting into the school? Nah, I think there must be more to the story than that. For example, for how long did the janitor refuse entry to the bombed-out Glaswegians... a day 'n half, or 5 minutes as he went to get the keys to open the doors? I wonder too, how the 120 people, loaded no doubt with belongings, got from the bombed area to the Pollokshields Primary School; quite a way for distraught refugees (we might reasonably assume they were distraught). Possibly vehicles had been provided according to "contingency plans", yet if there were transportation "contingency plans", why not similar accommodation plans? Yes, slip-ups sure, but hmmmm. Boppet wrote: As a child, I played in a WW2 concrete building in Rosneath - I've no idea what it was used for but it was built into the side of a very steep embankment leading down to a burn. I grew up in the west end of Glasgow and, in the early sixties, we would play on two sites which we knew as "bomb bee one" and "bomb bee two". "Bomb bee one" was opposite Notre Dame primary on Victoria Crescent Road (where the terrace has now been rebuilt). "Bomb bee two" was at the intersection of Crown Circus and Hyndland Street where there are now modern flats. I always wondered if these were really caused by bombs.